Tonight I would like to explain how calling from Java to .NET works with jni4net. The other way around is described in previous article, it would be good if you read that first if you didn't yet. 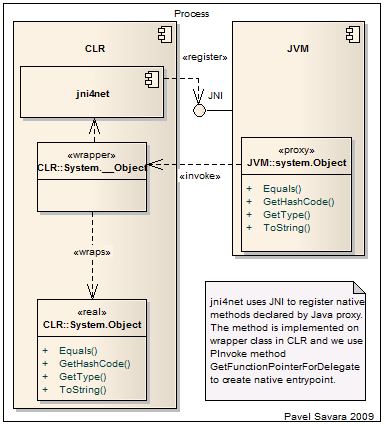 So, in JNI there is method which allow you to register native implementation of Java method. Such method had "native" keyword in it's signature. I believe that it's actually how low level methods in Java runtime are implemented. We use proxygen tool, which is part of jni4net, to reflect any public members of .NET type and then to generate Java proxies. Those proxy methods are marked native. The generator must do few translations to follow Java naming rules. Namespaces are always lower-cased to become packages. Properties are converted to bean-like get and set methods. For exceptions the situation is similar. system.Exception proxy is inherited from Java java.lang.RuntimeException to be throw-able. Therefore it isn't inherited from system.Object proxy. But there is system.IObject interface on both of them for your convenience. The proxy implements Java finalizer, so when JVM GC cleans up the proxy instance, the real CLR instance is released as well. The reference to CLR is implemented as GCHandle converted to long and kept on JVM side inside the proxy. The implementation is is asymmetric to CLR->JVM proxies, because for both it's CLR which does the translation work. The wrapper have signature which is expected by JNI RegisterNatives. I apply Marshal.GetFunctionPointerForDelegate to wrapper methods to get endpoint callable by JVM. Side note is that JNI RegisterNatives does not make any difference between static and instance methods. They are identified by name and signature only, strange limitation. Last trick I mention is about initial CLR bootstrap. During initial design I realized that there is way how to export native method from managed DLL. So I currently use that trick to create DLL with signature friendly to JVM. It seems to me now, that I will need to change my approach soon in order to support multiple versions of CLR and Mono on Linux. Probably I would need to use C++/COM. For now, we have 32bit and 64bit CLR 2.0 on Windows. Next time maybe about interfaces and type casting.